An alliance between Fiat and Chrysler would bring together two companies that, each for their own reasons, are currently, actively seeking a partner to help them forge a viable future. -- Under the tentative agreement, Chryslers North American plants would build four vehicles based on Fiats platforms and powertrains. -- Chrysler could also build in North America two vehicles for Alfa and one for Fiat, also distributing them using its current Dodge-Chrysler-Jeep network. -- Chrysler could build and/or distribute in North America the Daily, a mid-size van build by Fiats truck subsidiary IVECO. -- Fiat would make available its distribution network in key growth markets. -- Fiat and Chrysler would look for potential savings in combining their purchasing and logistic operations. -- In exchange of intellectual property rights evaluated at $3 billion, Fiat would receive a 35% equity stake into Chrysler LLC. -- The initial deal involves no cash investment by Fiat. -- Fiat could increase its stake to as much as 55%, but paying between $25 million to $200 million. -- Fiats initial 35%stake would come entirely from Chryslers majority owner, Cerberus, and not from Daimler, which has been trying to sell its remaining 19.9% stake. -- The deal is subject to federal approval as Chrysler seeks the final $3 billion of a $7 billion loan guarantee. -- Fiat expects to complete the deal by April 30. -- Fiat produced 2,813,870 vehicles in 2007, the most recent year for which global data are available. Chrysler produced 2,572,203. The combined 5,386,073 vehicles would have ranked them 5th globally. 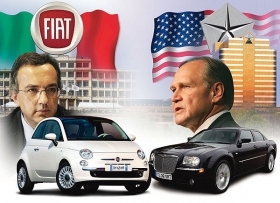 TURIN, Italy -- By joining forces, Fiat and Chrysler would both become stronger, but the proposed Italian-American alliance is just one step in two troubled recovery plans, not the final solution. The proposed alliance has clear, though not necessarily immediate, benefits for both sides. Chrysler would get access to Fiats competitive, fuel-efficient vehicle platforms, powertrains and components. That access will be a key element in the viability plan Chrysler has to set before the US Treasury later this month. It would help Chrysler to quickly start building the fuel-efficient vehicles it needs to restore its competitiveness in a North American market. The pact would allow Fiat reintroduce some of its own products to the US, including the Fiat 500 minicar and at least two Alfa Romeo models. -- Fiats Comau product equipment subsidiary is struggling to fill its order book. Retooling Chrysler plants to build models on Fiat platforms would help. -- Fiat groups components division, Magneti Marelli, which is strong in Europe, but not yet a mayor player in North America, could benefit in several of its operating sectors, from engine management systems to lighting and from Brazilian-built shock-absorbers to telematic systems. However, the expected savings, both on the purchasing and manufacturing side, are not on the immediate horizon: Production of the first Fiat-based vehicles in the US will start not sooner than 2011. Morgan Stanley auto analyst Adam Jonas in London calls the alliance a deal born of weakness on both sides, matching the fourth biggest European carmaker by volume in Europe with the fourth biggest in US. Paolo Mosole, auto analyst at Intermonte in Milan, has a more positive view on the potential Fiat-Chrysler deal, but is expecting more developments to take place. But even with their combined volumes, the proposed alliance does not fully correspond to Marchionnes blueprint to fix Fiat. The Fiat CEO believes annual volume of 5.5 million to 6 million units based on common vehicle architectures is crucial for survival in todays market. The 2007 combined volume of Fiat and Chrysler, about 4.5 million units, is a misleading number: only about 1.5 million units of Fiat-Alfa-Lancia passenger cars were based on common architectures. By 2015, if Fiat could confirm the viability of its long-term plan, the Italian automaker would be building about 2.5 million units based on common vehicle architectures, to which the US side could add another 500,000 units. Getting to 3 million units would be encouraging progress, but the proposed Fiat-Chrysler joint production would still lag at least 2.5 million units a year behind the 5.5 million units Marchionne believes is a safe level. If the proposed alliance is finalized, both companies would be stronger, but still require further and broader steps as part of the ongoing world automaker consolidation process.